I first met M&S in May 2012. 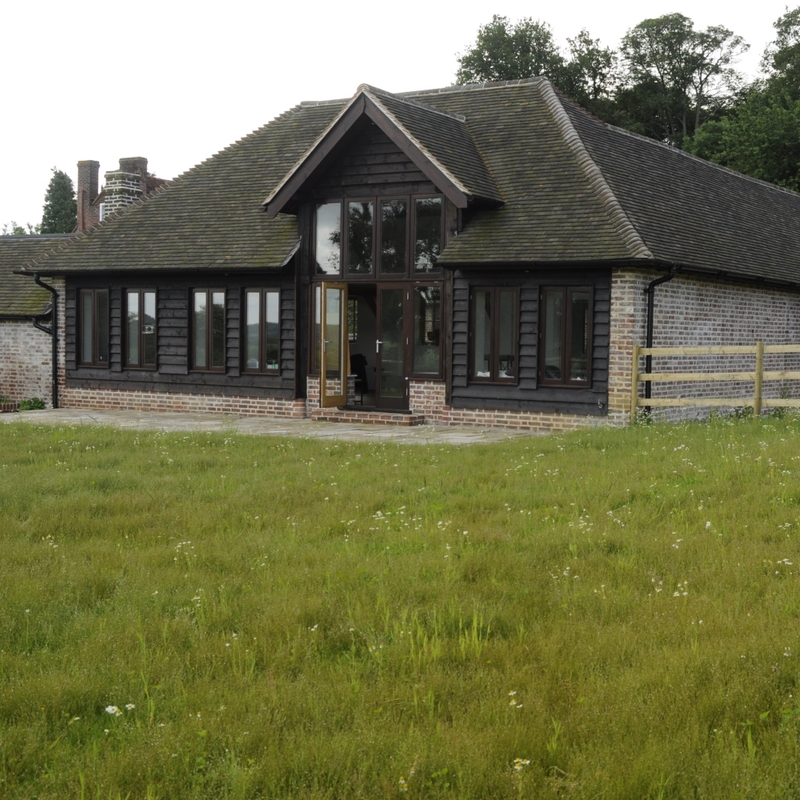 They had been living in the converted dairy for about 18 months before starting to focus on the garden. They wanted a modern country garden but without roses, delphiniums or pinks, and their most immediate priority was to create a visual barrier between the garden and the passing dogwalkers. The design took about nine months to finalise and then it was a further three months or so before the contractor started work. What originally looked like a field turned out to be a thin layer of so-so turf, by now more than knee high, over the broken up hard standing of the milking parlour. And under the rubble lay several huge blocks of concrete and a couple of underground chambers. Several diggers and grab lorries later, plus tonnes of new topsoil and by June 2013 the garden was almost ready for planting. 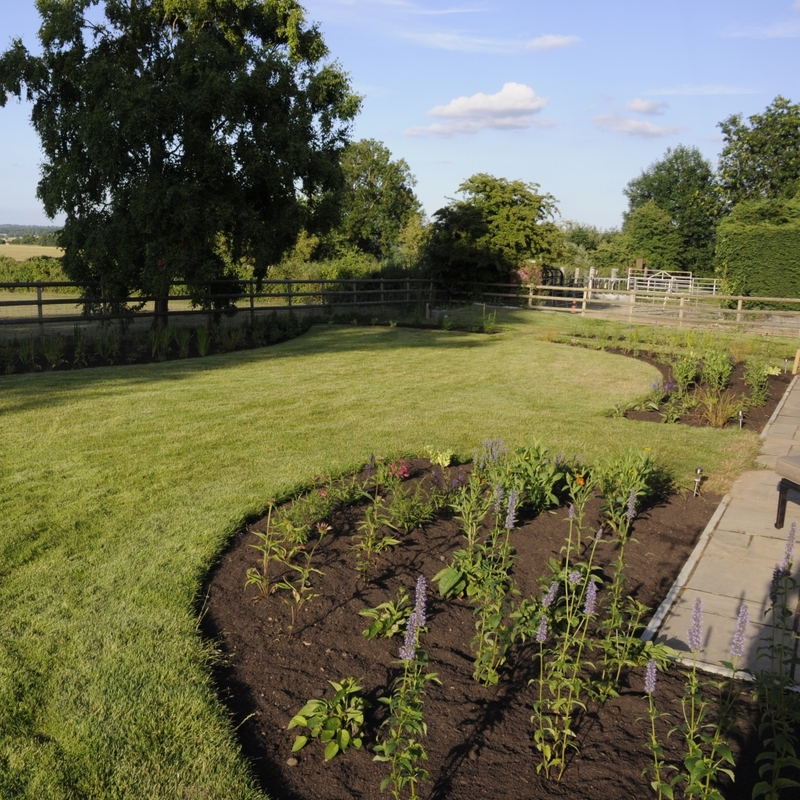 Most of the planting was done in July 2013, but not before a massive weeding job was done on the new borders (the result of not mowing for the best part of two years, and being next to a field). The plants looked pathetically small when they went in. The fact that it was a mini heatwave meant the hose was on a lot on the first few weeks. By August though some of the perennials were really going for it. The hedge of Calamagrostis, planted to help keep the neighbouring dog walkers at bay, was being stubbornly slow to put on any height. During the winter the new tree, a Sorbus aria Lutescens had gone in, plus a new hedge of beech whips. The grass hedge was still low though and the dog walkers enjoyed the view of the garden for a bit longer. 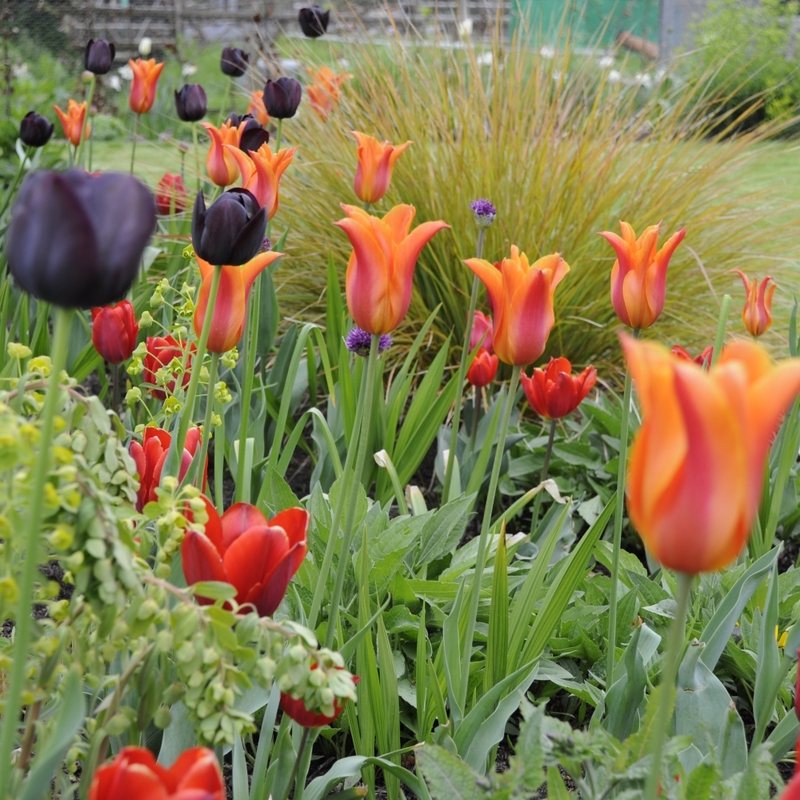 By April the hundreds of bulbs planted in the autumn were starting to appear, giving a shot of bright colour. The red ones were supposed to be tall but turned out to be comically short compared to the Queen of the Night and Ballerina tulips. The perennials have bulked up a bit through the autumn and are starting to put on a growth spurt. 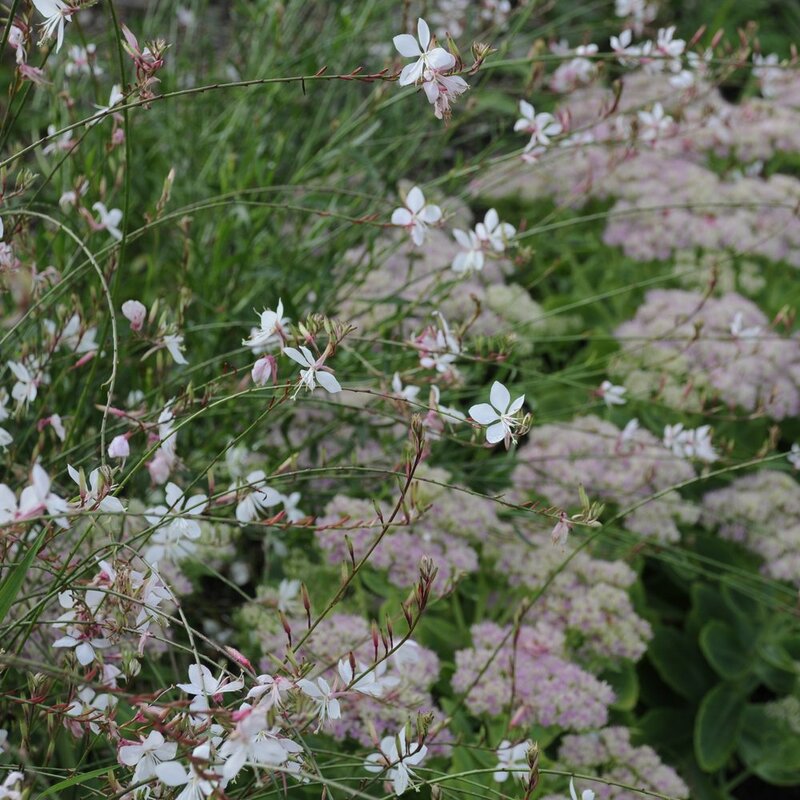 The first perennials in flower are the Euphorbias and Salvias, punctuated by lots of Alliums. The neighbour's builder wasn't impressed that everything seemed to be blue. By June 2014 the Salvias are still going strong and the Penstemons, Cenolophium and Sanguisorba are broadening the colour palette. This garden really takes off in July. Although it faces north there are no tall buildings nearby and most of the trees are on the northern boundary so the whole garden is in sun almost all day. The tall perennials and grasses grow straight up and only a few need staking after heavy rain. The colours are very rich, just what M&S wanted. The bees love the mix of Echinaceas, Verbena and Agastache. And finally the Calamagrostis hedge is tall enough and dense enough to block the view of the dog walkers. It's still looking really good in August 2014 with the late summer flowers from Echinacea, Gaura and Sedum with the grass Anemanthele filling out. From August into autumn there's a gradual fading of colour in the garden. But even on a wet November day the structure of the plants is still good, making the garden interesting even in rubbish weather. The structure of most of the plants holds out until January 2015 and this is how the garden looked before the big cut down. In early spring we mulched the garden, partly to improve the still fairly heavy clay and also to help keep some of the weeds at bay. The former was more successful than the latter. The display in July 2015 was even more spectacular than the previous year. 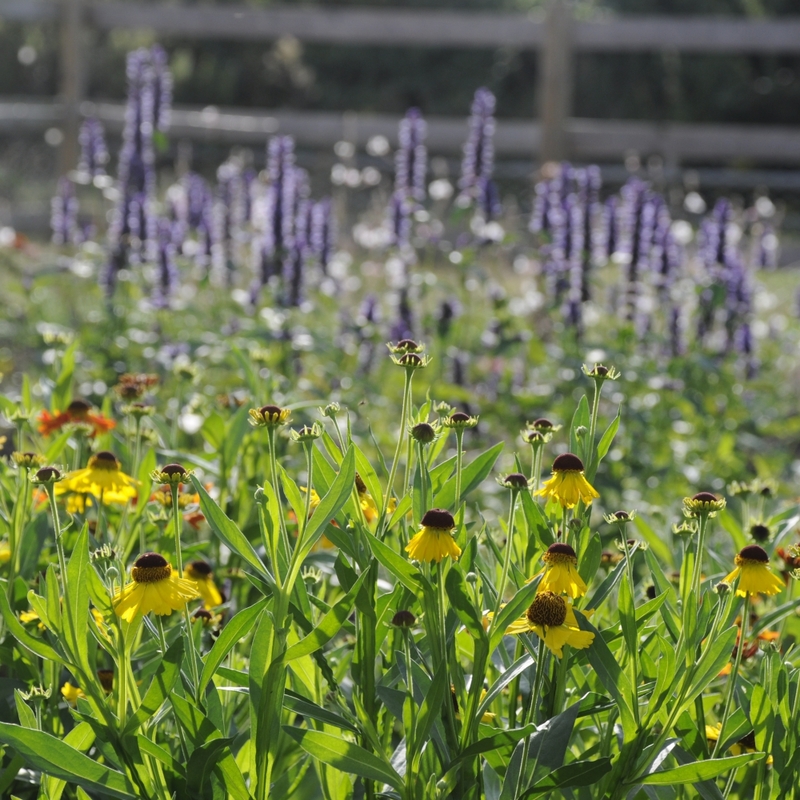 By July 2016 most of the perennials have reached maturity. We are starting to notice one or two problems though. The lovely blue Agastache has given up the ghost after a winter of very heavy rain. And two patches in the garden are causing some problems, one because it seems to get inexplicably wet and the other has no apparent cause. In the latter some of the Cenolophium and Calamagrostis have died. Yet both are doing well just a few yards away. We've replanted both areas since, with mixed results. It's still a work in progress but Japanese Anemones seem to tbe managing quite well. And here we are in July 2017. 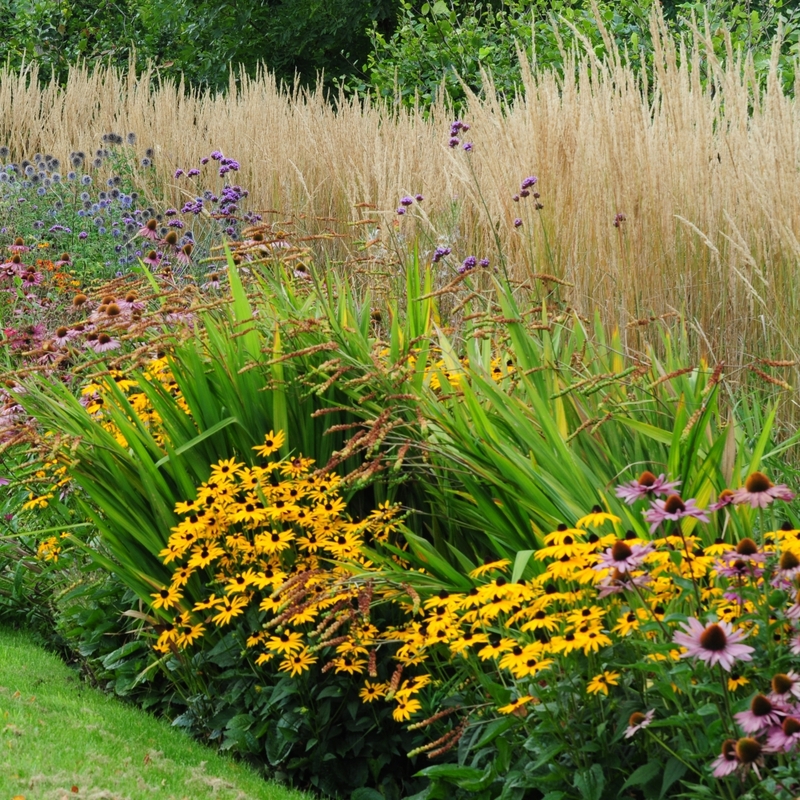 We have already divided some of the Rudbeckias and Calamagrostis to plant elsewhere in the garden. Some years the Euphorbias are splendid, some years they just die. The Anemanthele, a short-lived grass, has pretty much had it. Some have been replaced but this autumn the gaps could be filled by the successful Veronicastrum virginicum. The Salvias have had a bit of a time with slugs and snails and the weeds are unrelenting. But finally the beech hedge has formed an almost solid screen between the garden and the field. 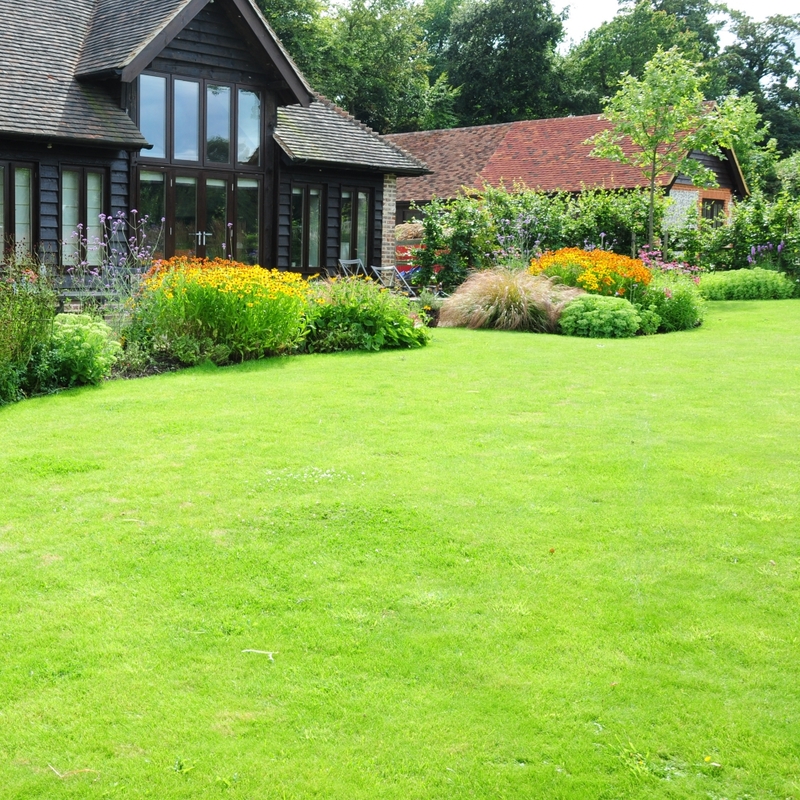 In the years between making a start on the garden and now the clients have built a new garage, converted the old garage into another room, built a kitchen garden, filled in a ditch, had a baby and adopted two hedgehogs. I'm still hopeful the pond that was part of the original design but postponed indefinitely might be on the cards again. Gardens,are always changing, making them unbelievably infuriating at times but also marvellously challenging and rewarding.